Image credit: © Chris Hunkeler Flickr, taken at the San Diego Zoo. Some rights reserved. Females - 585 mm (1.9 ft). Pelage: Chocolate to reddish brown. Chin and upper lip, white. Two layers of fur: outer guard hairs, undercoat of denser hairs that trap air for insulation. Range: Sub-Saharan Africa, south of 10° N latitude but not in southern tip of Africa except for KwaZulu-Natal. Habitat: Freshwater lakes, dams, rivers; not in coastal or marine waters. Populations in Wild: Declining; status largely unknown. Locomotion: Agile in water; emerge to sleep, excrete, give birth, and usually to eat their catch. Walk, run 4-5 km/hr (2.5-3.1 mi/hr), gallop 6-7 km/hr (3.7-4.3 mi/hr). Can stand vertically on hind limbs.Can jump a 1 m (3 ft) gap. Activity Cycle: Mainly diurnal; some populations nocturnal. Social Groups: Highly variable; some localities with foraging groups of up to 20 individuals, other places have mainly solitary hunting. Diet: Mostly fish; some crabs, insects and frogs in some fish-poor localities. Predators: Some reports of predation by Nile crocodile but not well documented. Sexual Maturity: Females (in captivity) can reproduce at 2 years. Longevity: Up to 8 yrs. in wild; up to 14 years in captivity. 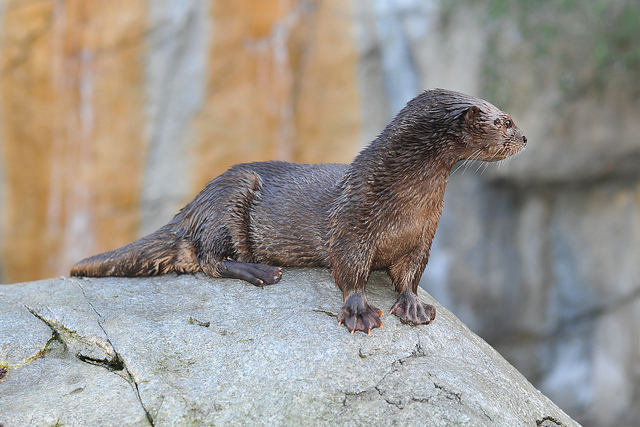 Feature Facts: Two layers of thick fur keeps otters from losing body heat in water; they groom fur by scratching and biting it (not licking) and by against grass, rocks, or logs. This activity is vital to their physical and mental health. San Diego Zoo Global: The San Diego Zoo's Ituri Forest is one of six places in North America where spot-necked otters from Africa can be seen. Two monkey species housed in this naturalistic four-acre African habitat often play "grab-the-tail" with these otters. © 2010-2016 San Diego Zoo Global. Updated 2015. Conservation status update 2016.